The British investigative journalist and author, Ian Cobain, has published a new book examining the United Kingdom’s post-WWII record of covert government actions and cover-ups. Included in “The History Thieves: Secrets, Lies and the Shaping of a Modern Nation” are accounts of Britain’s colonial wars in the 1960s and ’70s, the rise of mass surveillance and the undermining of the country’s criminal justice system. Of particular interest to Irish readers will be the chapter dealing with the UK’s past counter-insurgency operations on this island, “The Vault: Secrecy and Northern Ireland’s Dirty War“. Regular followers of An Sionnach Fionn will recognise many of the revelations, not least the strange phenomenon of spontaneous combustion among official documents in British military installations while investigations were being carried out into the more unsavoury aspects of the forty year conflict. “On the evening of Monday 8 January 1990, a group of British detectives decided that they had done enough for one day. It was getting late now, and some of the officers had been working for thirteen hours on a complex and politically fraught investigation that was being conducted against a backdrop of escalating violence. 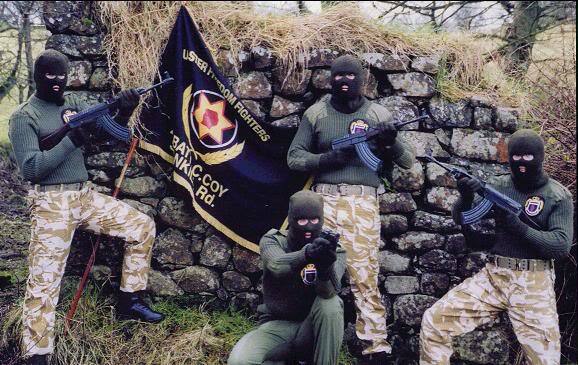 Northern Ireland’s savage little war had just entered its twenty-second year. Eighty-nine people had died the previous year. One, Pat Finucane, a lawyer, had been shot fourteen times after gunmen used sledgehammers to smash down his front door while he was having Sunday dinner with his wife and three children. Another was Loughlin Maginn, a father of four who was shot dead at his home in a village south of Belfast. It was the circumstances surrounding these murders, along with a string of others, that the police team led by John Stevens were investigating. At just past 9 p.m. they flicked off the lights of their incident room, locked up, and left the building. The facility from which they were working was no ordinary police station. It was located beyond the chain-link fences, the razor wire and the CCTV that protected a seventeen-acre complex that the Royal Ulster Constabulary (RUC) operated on the outskirts of Carrickfergus, a coastal town twelve miles north of Belfast. Known as Seapark, the complex was home to forensic science laboratories, exhibit stores, a suite of offices and no end of confidential archives. It was one of the most secure policing facilities anywhere in the world. Twenty minutes later, four members of Stevens’ team who had been conducting inquiries elsewhere arrived back at the incident room, intending to lock some paperwork away for the night. A heat-sensitive intruder alarm had also failed. Bynum raced to the guardhouse at the entrance to the complex, where an armed officer from the RUC was on duty. ‘My first word to him was to call for the fire brigade and he replied that the phones were down. I then told him to get on his radio to call for help and his reaction was one of almost disinterest, of: “Well what do you expect me to do about it?”’ By the time the fire was eventually extinguished, the team’s desktop computers had melted into pools of metal and plastic; steel filing cabinets had buckled, and the documents inside had incinerated. Whoever started the fire clearly intended to destroy every scrap of documentary evidence that the police team had gathered. This of course was just one of many incidences throughout the Long War when the documented records of the British authorities in the north-east of Ireland, civil, military and paramilitary, were “accidentally” or deliberately destroyed, or simply went missing. Invariably these losses coincided with research being carried out by third parties from the United Kingdom or in the wake of some notable atrocity. Of further interest to Irish readers will be Cobain’s detailed examination of the activities of Brian Nelson, the Abu Musab al-Zarqawi of UK terrorism in Ireland. The former British soldier from Belfast began his murderous career by taking a blowtorch to a young, disabled Irishman named Gerald Higgins, proceeding to torture him to near-death in 1974 (he succumbed to his injuries several weeks later). At the time Nelson was a member of the UDA-UFF, a militant pro-Britain or “loyalist” faction, while also serving as an agent for the Royal Ulster Constabulary (RUC), the UK’s regional paramilitary police force. In 1985 he was recruited by the British Army’s Intelligence Corps (IntCorps) while temporarily living in Germany. Returning to the Six Counties and the UDA-UFF, the Belfast man led a reign of terror against the Irish nationalist community the likes of which had not been seen since the late 1960s and early ’70s. Under the direction of the counter-insurgency strategists of the RUC, IntCorps and MI5, the Security Service in London, the agent transformed the “loyalist” gangs into a body of organised death squads spreading murder and mayhem across the north-east of the country. Answering to his immediate superiors in the infamous Force Research Unit (FRU), one of the many acronyms making up the British intelligence agencies, he became the United Kingdom’s most effective weapon in its war with the (Provisional) Irish Republican Army and the population supporting it. “Soon he was appointed as the intelligence officer for the UDA in west Belfast, playing a central role in selecting and locating targets for assassination. Although he occasionally kept this information to himself, Nelson would frequently pass details of these planned murders to the FRU. In June 1985, Nelson embarked upon the most extraordinary operation of his undercover Army career. The UDA’s leadership asked him to help arrange a deal with Armscor, apartheid South Africa’s arms corporation. A unionist from Armagh who had emigrated to Durban and was working for the company had been identified as a possible source of weaponry, and Nelson was asked to meet this man. The FRU not only encouraged him to do this, it paid for his airline tickets to South Africa and met his hotel bills. One of Nelson’s FRU handlers, a man whom he knew as Ronnie, had told him: ‘You’ve really hit the big time here Brian.’ While some have claimed the FRU sponsored this arms-trafficking enterprise in order to intercept the weapons and prevent them from falling into loyalist paramilitaries’ hands, others suspect that the FRU, and some of their political masters, were determined to help arm Ulster’s loyalists. In Durban, Nelson examined a number of weapons, and was particularly taken with an automatic shotgun called the Striker which ‘could be used to devastating effect . . . in close-quarter combat’. Armscor made it clear that it would accept a cash sale, but also wanted to know whether the UDA could provide it with one of the latest generation of ground-to-air missiles that were under development at Shorts, an aircraft and armaments factory in east Belfast. Armscor provided weapons to loyalist paramilitaries in a trafficking operation that was financed by a £325,000 robbery from a bank in Portadown, thirty miles south-west of Belfast. The corporation’s European agent, an American called Douglas Bernhardt, had learned that a large cache of arms held by a Lebanese militia in Beirut had come onto the market. Bernhardt arranged for the arms to be loaded into a container, which was shipped to Belfast via Liverpool, accompanied with bills of lading and notes of origin that indicated it held ceramic floor tiles. The weapons arrived at Belfast docks in late December, and were smuggled into the country undetected. Early the following month, at a farmhouse in County Armagh, the arsenal was divided three ways between the UDA, the UVF and a third loyalist paramilitary group, Ulster Resistance. The UDA lost its entire portion within minutes: its share of about 100 weapons was loaded into two hire cars, which were stopped and seized at a nearby police roadblock. Some of the UVF’s weapons were also recovered over coming weeks, but most remained in the group’s hands, and transformed the loyalists’ firepower over the years that followed. The portion that went to Ulster Resistance was never captured, however. Nor were these weapons decommissioned during the peace process: they remain hidden today. “The British state has been conspiring to murder its own citizens in Northern Ireland. That is the only credible conclusion that can be drawn from the evidence that has seeped slowly into the public domain over the past decade. It now seems clear that members of the security forces, acting in cahoots with loyalist paramilitaries, have facilitated sectarian and political killings. Hopefully there are some revelations about Robin “the jackal” Jackson. An even more shadowy murderous figure. Dammit man, just shoot the lot of them, the Irish that is, then the Empire might have some peace again. And if they can be persuaded to shoot one another all the better and more fool them.